An impressive cast of artists are joining together in this Ondine recording dedicated to the late works by iconic American composer Elliott Carter (1908�2012). The album includes five premiere recordings, including Carter�s final work Epigrams (2012) for piano trio, featuring Pierre-Laurent Aimard, Isabelle Faust and Jean-Guihen Queyras. The album also features percussionist Colin Currie joined together with the Birmingham Contemporary Music Group and the BBC Symphony Orchestra conducted by Oliver Knussen. No other great composer has lived to such a ripe and productive an old age as Elliott Carter. When he died five years ago at the age of 103, it was not after having faded quietly into the background, nor endlessly revisiting and revising old works, but in the full flow of a prolonged and extraordinary Indian summer, which saw an extraordinary outburst of creativity through his 90s and beyond. This new disc from Ondine contains only a portion of his late works, most of them for orchestra and featuring prominent piano parts, and it is a glowing tribute from some of the musicians who tirelessly championed his music in later years. Born in New York City on 11 December 1908, Carter heard the New York premiere of Stravinsky�s Rite of Spring in 1924. He studied at Harvard with Walter Piston and Gustav Holst, and was mentored by Charles Ives. His early music was in a neo-classical style, but in the post-war years he reinvented himself as a musical modernist, and his music of the late 1950s onwards includes some fabulously demanding and complex scores. Long after American music nailed its colours to the minimalist mast, Carter remained a committed and productive modernist, writing works of uncompromising toughness, challenging yet never forbidding, and combining a ready wit with an underlying lyricism. In later years, Carter�s music kept its modernist edge, but its dimensions became more compact. Longest of the works on this disc is Interventions (2007) at 17 minutes. Composed for James Levine and the Boston Symphony Orchestra with Daniel Barenboim at the piano, it pits the two musical Titans against one another in music of sparkling intensity that is constantly absorbing. The flowing violin melody that is often interrupted has a Berg-like expressivity to it, and the ending, where the B flat (B in German, for Barenboim) and A for the orchestra/Levine, dissolve into a closing trill, is a masterstroke. Other works composed for Barenboim are the concerto grosso-like Soundings (2005), where the notes D and B flat are a musical cipher for Barenboim�s initials, and Dialogues II (2010), the second of a pair of works for piano and chamber orchestra which once again provide plentiful evidence of Elliott�s fundamental human engagement with his musical materials. Two Controversies and a Conversation (2011) has its roots in a mini-concerto for piano and percussion composed for Colin Currie. At the suggestion of Oliver Knussen (one of Carter�s most ardent champions), the composer expanded the original work with two prefatory �Controversies�, and the score once more pits the protagonists against one another in music of astonishing colour, energy and inventiveness. Instances (2012) for chamber orchestra was composed for Ludovic Morlot and the Seattle Symphony. A mere seven minutes long, it culminates in a deeply affecting closing section which, as John Link points out in notes taken from a forthcoming book on Carter�s late music, �is both disconsolate and resolute�, a passage that comes closest to being the composer�s swansong. Carter�s final composition was a series of twelve Epigrams for Pierre-Laurent Aimard, scored for piano trio. This is music of almost Webern-esque conciseness, brightly polished but abundantly colourful, fragmentary but with a tangible background continuity. It is the product of a musical mind still, incredibly, at the peak of its game, and it finds ideal interpreters in Aimard, along with regular violin-and-cello team Isabelle Faust and Jean-Guihen Queyras. It is similarly hard to imagine the orchestral works being more persuasively played than by the Birmingham Contemporary Music Group and (in Interventions, Soundings and Instances) the BBC Symphony Orchestra, with Knussen at the helm. Aimard does all the honours at the keyboard, in playing of incredible focus and commitment, and he meets his match in Colin Currie for Two Controversies and a Conversation. 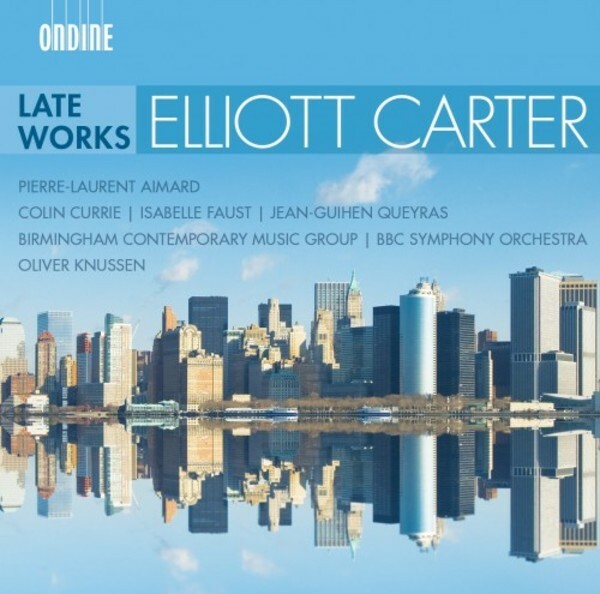 With demonstration quality sound and attractive presentation from Ondine Records, this is not only an essential disc for contemporary music collectors, but also an ideal, indeed matchless introduction to Elliott Carter�s extraordinary late output. You�re unlikely to hear modern music in performances of greater expertise, commitment or sheer allure.